While hunting through her closet yesterday for something green, Lauren paired together rolled-leg cargo pants and an amazing green snakeskin belt with gold lion clasps. She then showed up at my apartment to find I was also wearing green rolled-leg cargo pants with a chunky pearl necklace complete with a gold lion medallion at the end. I promise, we don't plan these things--and anyway it was too late for one of us to change. After a mini fight over the jacket that Lauren refused to take off even though it offended my anything-print sensibilities (stripes count), I will admit when seeing these photos that she was right. Without the jacket the look just isn't complete. Add some green beer to the mix and she was set. We stumbled across this location on our way to our first St. Patrick's Day-o'drinking stop and the photographer in me squealed when I saw how the yellow line popped against the green and blue colors in Lauren's outfit. What luck. You are stunning! This is a fantastic outfit. Your pants are all kinds of awesome. I wish I had a pair like these! great look dear!love your blazer!! Those pants are pretty amazing and that belt is just incredible! Very cute outfit! Now this is dressing up for a holiday :) LOVE IT! Great blazer as well! I adore this striped blazer! What a perfect combo with those navy green/olive pants. Absolutely fabulous <3 Living in Color. What a chic outfit!Love your vintage belt! So gorgeous! I loved this look!!! the deep green and the versace insp. belt looks great together!!! 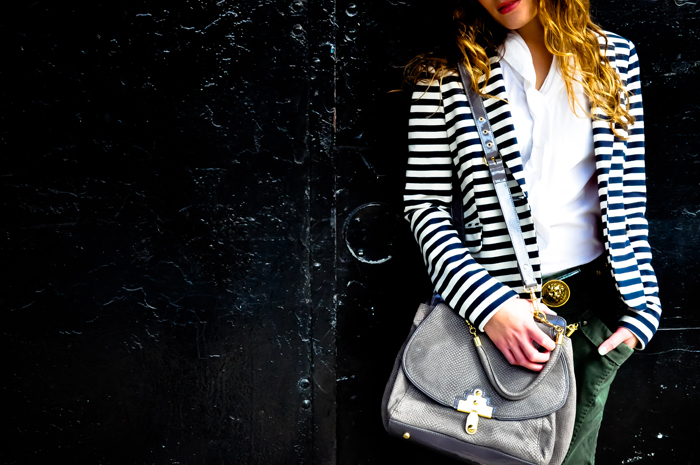 great way to incorporate green and love that you paired it with a striped blazer, very chic! love Ireland, and your outfit, the blazer is amazing!!! Nice post,I love your blazer and your blog is lovely! ohh I LOVE those pants you got! and the belt goes with it so nicely! Those pants.....are absolutely amazing & perfect; the color is splendid in how it almost changes with the different lighting and angles. and the cut is impeccable! Loving your blog. newest follower. I like how you mix and match stripes, green and lions effortlessly. Just found your blog and im loving your style and blog. So electic chic. If you like we can follow each other via GFC and bloglovin? I love this outfit and your style! Following you now! love the photos! and i have a striped blazer i adore too! I love every single detail of this outfit! I am your new fan...I looove your style! That outfit is so cute! Love the belt! I am obsessed with stripes! Great blazer!